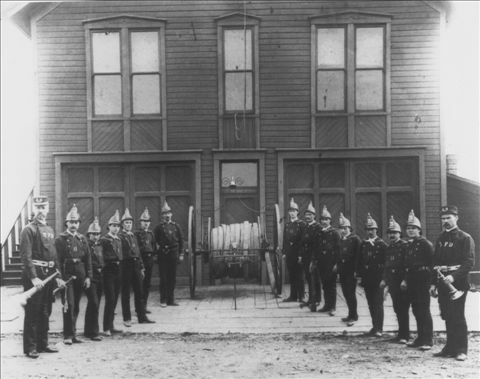 Tacoma was the first city in Washington to establish a paid fire department. In part, this was due to the great Seattle fire of 1889. Within two weeks of the fire which devastated Seattle, the Tacoma City Council voted to put its volunteer department on salary. Since the early 1900s, Tacoma's fire fighters have been unionized and active in issues important to the working men and women of Pierce County. By 1917 fire fighters in Tacoma saw the need to organize and formed the City Firemen's Federal Union No. 15601, chartered by the AFL. Until this time, fire fighters worked twenty?four hours a day, with one hour off for each meal and every eighth day off. After six weeks a fire fighter was given a weekend off. After years of struggle to obtain a work shift that offered a fire fighter some semblance of home life, the union persuaded the city to go to a two?platoon system on September 7, 1917. This lowered the workweek to eighty?four hours, in which half the department worked a ten?hour day shift and the other half worked a fourteen?hour night shift. The shifts switched after thirty days. According to Battalion Chief Earle More, who worked on the Tacoma Fire Department from 1913 to 1959, "You never saw such a change in the morale of the men. They felt like they had been released from prison and the old fellows, as we would refer to them, were so happy to think that by solidarity in our union, we had at last broken the backs of the politicians who labeled themselves `The Tax Payers League'." 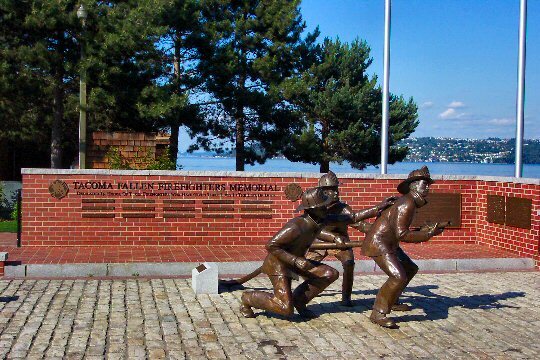 Tacoma was represented when the International Association of Fire Fighters was formed on February 26, 1918. Tacoma became a charter member and to this day carries its local number 31 with great pride. Because of the dangerous nature of their work, a good pension system has always been important to fire fighters. The first pension law in the state was enacted in 1909, providing any fire fighter injured on duty with a pension equal to one half his salary. The law also allowed for a retirement allowance of one half salary after twenty years of service and fifty five years of age. By 1919 these benefits were extended to surviving spouses, with the spouse receiving one half that which would be due the fire fighter. During the early 1930s the fire fighters did what they could to ease the effects of the depression being felt by Tacomans. Volunteering their time, the fire fighters investigated conditions of needy families and reported cases of want to relief agencies. The fire fighters also maintained two wood yards where unemployed heads of families could apply for firewood. They would cut three ricks of wood, taking two and leaving one for widows with children. Fire fighters also operated a relief kitchen out of headquarters, where food was distributed to hungry families. On December 5, 1930, police officers and fire fighters played a football game in Stadium Bowl to raise money for charity. Ten thousand people watched the two departments battle to a 13?13 tie. In 1932 police and fire fighters' pay was cut by 10 percent and in 1933 by another 12 percent. The Police Guild and Local 31 fought the pay cuts all the way to the Washington State Supreme Court, where in 1935 over $200,000 in back pay was awarded to employees of the two departments. In 1932 the fire fighters' work week was reduced to seventy two hours. In 1933 the pension law was again amended to allow an individual to retire after twenty five years of service, no matter what his age. However, this pension was capped at $125 a month. By 1947 the city had adopted a three platoon system, and the workweek had been lowered to fifty six hours with shifts remaining the same ten hour days and fourteen hour nights. Then in 1983, the department returned to the twenty four hour shift and lowered the workweek to 46.6 hours, where it remains today. The pension system saw only minor changes until 1970. Working with other locals in the Washington State Council of Fire Fighters, the union became politically astute and active during the 1960s. The efforts resulted in creation of the Law Enforcement Officers and Fire Fighters (LEOFF 1) pension plan in 1970. The LEOFF I plan allows a disability pension for job and nonjob-connected disabilities at a rate of 50 percent of final salary. It also allows service retirement after five or more years and age fifty. With five to ten years' service, there is a 1 percent per year benefit; with ten to twenty years a 1.5 percent benefit, and with twenty or more years a 2 percent benefit up to a maximum of 60 percent. By 1977, with the prevailing mood in Olympia less sympathetic to fire fighters, the LEOFF 11 plan was adopted. Not only did this plan severely limit disability benefits, it did not allow for service retirement until the age of fifty eight at 2 percent times years of service, reduced actuarially from the difference between the age at time of retirement and age fifty eight. Since enactment of the new law, all pension reform legislation changes sought by the fire fighters have been directed at lessening the disparity between LEOFF I and LEOFF II members. Overshadowing these changes was another event within the Tacoma Fire Department. On March 30,1972, the city hired its first black fire fighter. Although recruiting programs began as early as 1968, a joint effort by the International Association of Fire Fighters, Tacoma's local 31, and the City of Tacoma led to the hiring of the first permanent employee. The IAFF was given a grant by the federal government to conduct labor recruitment. Local 31 actively participated in this program with two stipulations: it would be available to everyone and Local 31 would supply the director from its own ranks. Tacoma was so successful that one of its directors was hired by the international to travel around the country setting up similar programs. Local 31 was also instrumental during this time in forming Tacoma's Joint Labor Committee. This is a group of union representatives who bargain for all union personnel working for the city. This committee negotiates all uniform benefits for city employees. Today's Local 31 is comprised of over 400 members, representing all ranks from battalion chief to fire fighter. Dues are based on 1.5 percent of a member's wage. The union is politically active on the community and state level. A Morning News Tribune article named Tacoma Fire Fighters Local 31 as one of the ten most influential persons or organizations in Pierce County. The union's charity work continues in many areas. In 1973 the Fire Fighters Burn Center at St. Joseph Hospital was created. Since that time, Local 31 has donated over $200,000 to the center. The union was also instrumental in creating the Washington State Council of Fire Fighters Burn Foundation and contributes to the IAFF Burn Foundation. Other charities the local donates to and actively supports are United Way, Boys and Girls Clubs, Muscular Dystrophy, area food banks, and Special Olympics. A committee within the local distributes over $14,000 a year from membership dues earmarked for charitable donations. Union members manage to have their share of fun while accomplishing their goals. On May 20, 1938, in what can be considered a forerunner of the Fire Fighters Ball, a benefit dance for a young burn victim raised $1,500. The Fire Fighters Ball is held yearly with all proceeds going to the burn center. To raise money for this and other charities over the years, the union has fielded teams to play baseball in the Tacoma Dome against the Seattle Fire Fighters and the Bellevue Fire Fighters. Also, a football team was sent to Olympia to play a combined Thurston County, City of Olympia Fire Fighters' team. The early 1980s saw the Tacoma Fire Fighters' strongest baseball teams. These teams continually qualified for regional and national tournaments, one year placing fifth in the International Fire Fighters Tournament. The union enjoys a good working relationship with the management of the department. The union and staff meet twice monthly to discuss items of mutual interest and, until a recent incident necessitated filing one, a grievance had not been filed for many, many years. Although most locals with the IAFF are active, Tacoma's local remains one of the most progressive and involved in the country. Local 31 has among its members a past international vice, president, a past state council vice, president, a state council district representative, and several members placed in key positions on various state committees. This is our memorial to our fallen firefighters.